In this Shloka, the focus is on ‘Vishnum Vande’ meaning ‘I salute Lord Vishnu’. The adjectives used in this verse describe Lord Vishnu’s attributes, His power, His grandeur and His magnificence. The name ‘Vishnu’ appears three times in the body of the Sahasranamam. We will examine the basic meaning of Vishnu which would be considered in this part and will look at other meanings when we discuss the relevant verses. The word ‘Vishnu’ comes from the root ‘Vish’ which means to enter. ‘Veeshati iti Vishnu’ – He Who penetrates everywhere. He is ‘Sarva Vyaapee’ and ‘Sarva Antaryaami’ meaning He is all pervasive and penetrative. He is everywhere – at the macroscopic level and the microscopic level, at the cosmic level as well as the atomic level. 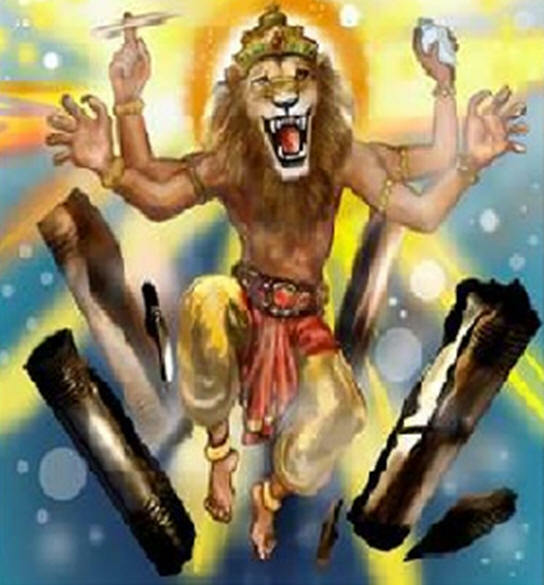 He demonstrated this by appearing as Narasimha emerging from a pillar in the court of demon Hiranyakashipu to the call of prayers of his ardent devotee, the child Prahlada, when challenged by his father to show him the Omnipresent Lord. Shaantaakaaram – He is the personification or embodiment of Shaantam i.e. tranquility and serenity. There is no single word in English that gives the full import of the Sanskrit term Shaantam. It is all of peace, tranquility, stillness, imperturbability, contentment, freedom from passions and indifference to worldly objects and pleasures. Lord Vishnu is not only Shaantam exemplified but He also bestows this Supreme quality on his devotees. His devotees have everything and forever enjoying the bliss of his Shaantam. Meditating on Him is Shaanti, Shaanti and Shaantih for physical, astral and causal bodies. Bhujagashayanam – Bhujaga means a serpent and Shayanam means a bed. He has a serpent as his bed. A serpent is called Bhujaga because ‘Bhujaihi gacchati’ – It moves on its arms. Symbolically serpent represents temptation. Temptation always creeps in stealthily like a serpent. Bhagavan Vishnu using the serpent as a bed shows us that we should exercise control and attain mastery over temptations. Padmanaabham – ‘Padmam Naabhou Yasya Saha’ meaning one who has a Lotus in his navel. 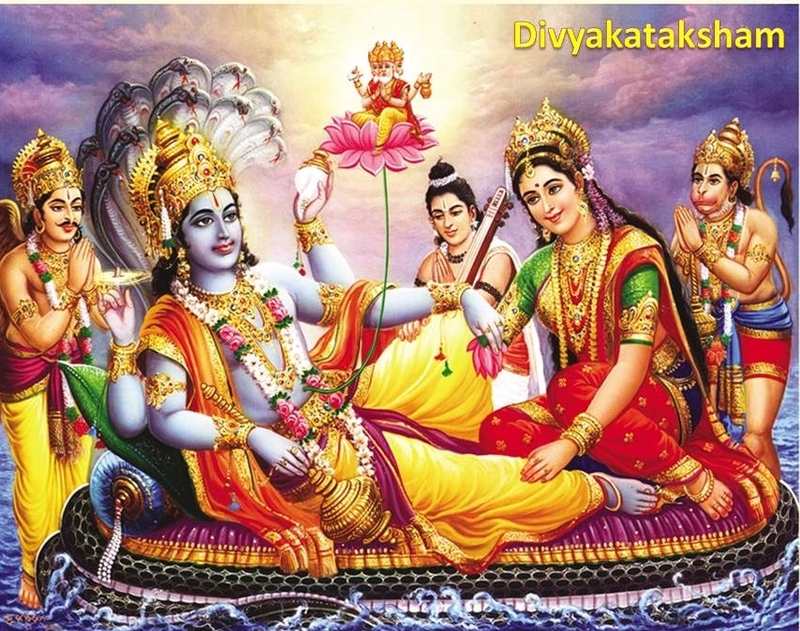 Brahma the Creator is seated on the Lotus which is attached to the navel of Lord Vishnu. The Nama Padmanaabha also appears three times in the main Sahasranamam. There are other meanings which we will take up later. Suresham – ‘Suraanaam Ishvarah’ meaning the Lord of the Devas. This Nama appears in the main Sahasranamam. Vishvaakaaram – He is the embodiment of Vishva or the Universe. Some versions give this as ‘Vishvaadhaaram’ meaning the foundation or the root cause of the Universe. Gaganasadrusham – Gagana is the sky and Sadrusha means comparable to or He is like the sky on many counts. He is blue in colour. He is everywhere. He is mighty and He is grand. Everything resides in Him. We will be seeing this concept more closely when we take up individual Namas like ‘Sannivaasaha’ and ‘Bhootaavaasah’ in the main Sahasranaamam. Meghavarnam – This is a further take from Gaganasadrusham. Megha is cloud and Varnam is colour. Bhagavaan is dark blue like the cloud, in particular the rain bearing cloud. Megha has a special place in the hearts of poets. Kalidasa has immortalised in his Meghasandesham, the exiled Yaksha’s message to his lady-love using a cloud as a messenger. The famous Gitagovindam of Jayadeva starts with the line ‘meghair meduram ambaraṁ – the sky covered with clouds’. Krishna is described in many compositions as Neela Megha Shyama! Shubhaangam – Shubha means both beautiful and auspicious, Anga means body parts. Lord Vishnu has a captivating form that is auspicious, showering his grace on the devotees. This Nama appears twice in the Sahasranamam. Lakshmikaantam – This Nama means that He is the consort of Goddess Lakshmi. When Lakshmi Devi emerged with a garland in her hand while the Milky Ocean was being churned for nectar, she set her eyes on Lord Vishnu and offered the garland to Him immediately ignoring all the other Devas present. Vishnu became Lakshmikaantan from that moment. Kaantan also means somebody who attracts, so Lakshmikaanta also means someone who attracted Goddess Lakshmi. In turn Vishnu is also attracted by Lakshmi so much that Lakshmi is called ‘VishnuVakshasthalaalayaa’, One who resides on Vishnu’s chest. Kamalanayanam – Kamala means Lotus and Nayanam means eye. He is someone with beautiful Lotus like eyes. In the Sahasranamam we also have the name ‘Aravindaakshah’ with exactly the same meaning. ‘A Yogi is greater than an ascetic. A Yogi is greater than the intellectuals and knowers’ of Veda. A Yogi is greater than the furtive worker. Therefore, O Arjuna, in all circumstances, become a Yogi’. A Yogi can reach the Lord by meditating on Him in his heart. In some versions Yogihriddhyaanagamyam is taken as Yogibhir dhyaanagamyam. This means he is attainable to Yogis by meditation. The meaning is virtually the same except that there is no explicit mention about the heart being the seat of meditation. ‘The residents of all the worlds, O’ Arjuna, from Brahmas world, the most evolved material plant in the Universe to all others, are subject to repeated birth, O son of Kunti, on attaining Me, there is no rebirth’! Sarvalokaikanatham – Sarva means all; Loka means world; Eka means only and Natha means leader or head. He is the one and the only Head of all worlds meaning the Lord of the Universe. Lord Vishnu, who exemplifies tranquility, calm and serenity, the One who is lying on the Serpent AdhiSeshan, the One from whose navel emanates the Lotus flower on which Lord Brahma is seated, the One who is the Leader of the Devas, The One who is the Cause of this Universe, who is as gigantic as the big blue sky, who has Deep Blue complexion similar to the rain clouds, the One who attracts Goddess Lakshmi, the one who has Lotus like beautiful eyes, the One who resides in Yogis’ and the one who bestows Moksha and thereby liberates us from the fear of Samsara or the cycle of birth and death, I bow to that Supreme Lord Vishnu, who is the Ultimate God. Why the sky appears blue is known to Scientists.Bhagawan is All pervading and Panchabudhas are His creations. So the AAkasha is compared withe All pervading Vishnu who shows Him as a Neela Megha Shyamalan. Any comment. The sky/Akasha is blue, the cloud appears white and the one bearing(cloud) appears dark due to thickness and growth.Why compare the Lord with Cloud? Comparisons are used to frame an image in mind…. For a child the image helps to comprehend the Lord .A child asked why Krishna is blue. I replied Krishna is everywhere like the sky and so He is blue. In essence the Yogi in the highest plane identifies Him as the Lord Himself. Hence they are ONE as in Adwaitha Philosophy. However the ordinary human cannot go to that plane. Hence we have to visualize the different Forms of the Omnipotent/Omniscient/Omnipresence which slowly leads us from darkness untoThe Light. Reading our scriptures and following them leads us to Good. Let us follow the path of Satsang. This is so beautiful to read, especially first thing in the morning. Thank you for sharing such wonderful words and thoughts with us. Very clearly explained. Feeling Divine! Thank you! Beautiful! beautiful! Sridhar, you have explained this so nicely that even a moron like me can understand! Thank you.